Surname: Lofthouse. This interesting surname is English, but arguably of pre 7th century Old Norse origins. It is a locational name from any of the various places in the county of Yorkshire named with the word “lotht”, meaning an upper floor, and “hus”, a house. These places include: Loftus in North Yorkshire, Lofthouse near Wakefield in West Yorkshire, and Loftsome on the river Derwent in East Yorkshire. Houses built with an upper floor (which was normally used for storage of produce during the winter) were rare amongst the ordinary people of the Middle Ages, and consequently such an unusual feature would have provided an obvious and convenient means of identification. Early examples of the surname include: Ralph de Loftus, John del Lofthouse and Robertus Lofthouse all of Yorkshire, in the years 1219, 1365 and 1379, respectively, whilst Robert Lofthouse of Lyndene, in Scotland, was convicted of concealing certain “paise penneis” or English gold coins in 1502. He was the earliest recorded bearer of the name in that country. A coat of arms granted to the family has the blazon of a black shield charged with a chevron engrailed between three silver trefoils slipped. The creat is a spur between two wings proper. The first recorded spelling of the family name is shown to be that of Peter de Lofthusum. This was was dated 1166, in the Pipe Rolls of Yorkshire, during the reign of King Henry 11nd of England, 1154 – 1189. Throughout the centuries, surnames in every country have continued to “develop” often leading to astonishing variants of the original spelling. ‘ Copyright: Name Orgin Research www.surnamedb.com 1980 – 2010. The following information relates to Lofthouse’s of the Grewelthorpe area, it has been taken from Parish Registers, School and census records, Memorial Inscriptions (M.I.) in Grewelthorpe churchyard, and information sent in by other researchers. because the information has come from so many sources I cannot vouch for the accuracy of everything. It is therefore wise to search the original records if at all possible.Last update Jan. 2015. If you find the following information helpful or have anything to add please get in touch by email. A request for help from Fred Lofthouse sent Oct. 2014.Name: Fred LofthouseE-mail: fred.loft32@gmail.com In the Grewelthorpe family history there is more than one reference to Christopher Lofthouse 1729/1808 my 5x GGF there is also a picture of his grave. I am now 81 years old and I cannot travel long distances, so is there anyone in Grewelthorpe [or Kirkby Malzeard] who could take a clearer picture and send it to my email address please? I would be eternally grateful. Richard Howard set the following message Dec. 2012.“Back in 2008 I carried out some research on ‘brewing’ in Masham and came across Henry Lofthus (Lofthouse) who I had identified as a brewer. Henry was listed many times in connection with various inns where he provided surety to a number of innkeepers seeking to hold a licence or renewing their licence and he indicates in certain records his trade as a brewer. I have continued, from time to time, to make inquiries about the ‘brewers’ of Masham and would appreciate any further information you may have. Richard Howard. If you can help Richard please contact the site. Thanks to Charles Taylor who sent the following Feb 2012. The entry George Loftus b1714 which shows marriage to Sarah Spence should also show Ellen or Elenora Johnson 2 feb 1763 George was married twice.George Loftus born 1746 was married to Catherine Steel 10 Feb 1777. These two Georges are in my family tree. This may answer Ron and his problem with ages of 14yrs/ 15yrs in the marriage of the two Georges. My problem now is George B1688 and his Father & Grandfather.Regards Charles Taylor. Request for information from Andy Lofthouse. He would like to hear from any one who can give information about Christopher Lofthouse born C1729 died 1808. husband of Dorothy Gill. Ron Watson sent the following asking for information. I am a direct descendant of Christopher b. 1729. My mother was – Clara Watson nee Lofthouse b.1908 daughter of Charles George Lofthouse b 1875, son of Robert Lofthouse b 1838son of Charles Lofthouse b.1792son of Christopher b 1763son of Christopher b. 1729. My leg of the family appear to have travelled via Sawley, Hemsley, Darlington, Yarm and finished up in Middlesbrough. Is there any evidence that Christopher b1729, Ralph b 1688 and George b. 1688 are related ? January 2011. Ron sent the following addition to his previous request.Lofthouses from Dallowgill and Kirkby MalzeardExcerpt from www.selectsurnames.com.There are two Lofthouse families that have been traced to this area of the Yorkshire dales, one starting with George Lofthouse (born around 1680) and the other with Ralph Lofthouse (born around the same time). Many of their descendants were buried in St. Andrew’s Church in Kirkby Malzeard. The family farms, Knott farm and Ladyhill farm, are still standing.There are descendants in Utah of these Lofthouses because of James Lofthouse who emigrated there in the 1850’s and founded the Mormon town of Paradise. Here are Ron’s ideas about the parentage of Christopher & George. I have many references to Lady Hill Farm in my research – all on Christophers 1729 side, including Ann Lofthouse b 1804. I have one reference to Knott Farm in relation to Anthony Lofthouse b. 1802. Anthony and Ann were distant cousins who married and moved from the area . Ann finished up in Cache County, UTAH and her son James started the Mormon community and set off a large Lofthouse community there. Ann’s Grandfather was Christopher b1729. (Ladyhill Farm). Anthony’s GGF was George ( Sarah Spence ) b1714. ( Knotts Farm ? ) So was Christopher’s father George 1688 – see above and was George’s ( 1714) father Ralph c1680 This would explain away George and Sarah only being 15 / 16 years of age if Christophers 1729 was theirs. If you can add anything to Ron’s ideas please contact him. Thanks to Maria Kingston who sent more information about Ann & Anthony Lofthouse. including a picture of Ann. See below.Ann and the Lofthouse family appear to have been in the Dallowgill area for many generations. A pretty special place it is too, I have enjoyed a couple of visits there myself. Ann was buried in Paradise in Utah where her descendants still farm some of the original “Lofthouse acres”. Out of interest, Ann was the great grandmother of Jessica Lofthouse who was a well known author and artist in Lancashire. Jessica wrote many books on Lancashire, The Dales and the The Lake District, plus made many TV and radio appearances in the 1950’s and 60’s. A pretty feisty lady she was too, maybe like her great grandmother! Thanks to Kathleen and Derek Lofthouse for information about Henry Lofthouse b.1840. son of Robert & Martha.In Jan 2011 Kathleen sent the following request for information. I have been looking into the life of Robert Lofthouse b1837 son of Robert and Martha Lofthouse and brother to Henry. I have found a Robert Lofthouse (Tailor) living in Leeds but his wifes name was Margaret. He married Margaret Rhodes in Knaresbro RO. in 1863.Do you think this is the same Robert who married Jane Atkinson in KM in 1862? I have found 2deaths for a Jane Lofthouse, one in Hunslet the other in Northallerton in 1862. I am thinking of sending for Roberts marriage cert to Margaret as it should say he was a widower if he told the truth. If it is the same Robert he didnt waste any time remarrying and unusually at a register office! If you can help Kathleen please contact the site. Thanks to Tracey Spence for information about Robert & Martha Lofthouse [nee Snowden] & their family. Thanks to Barbara Lofthouse of Leicester whose history is at the end of this page. Joan Malcouronne is seeking information re. John Lofthouse 1827 [Rainton]-1899 married Ellen Williamson b.1828, in 1849 in Stockton. He was a farm labourer.> My ancestor their daughter Sarah Ann b.1852 Can anyone give me more information or a contact name. 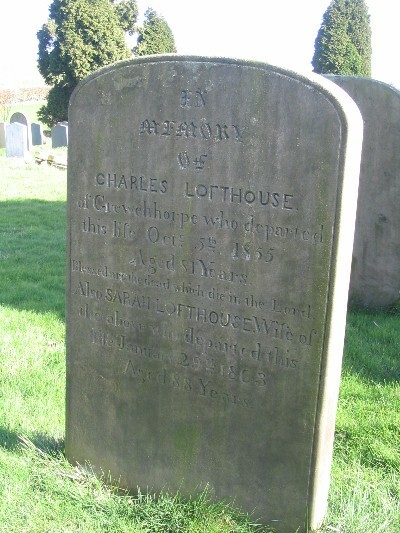 Thanks to David Pease for information about Charles & Sarah Lofthouse. Thanks to Lisa Blackburn for the following letter. July 2013.I just stumbled upon your Lofthouse family information looking for my great uncle Anthony Lofthouse, who died during WW1.My great grandfather is John Thornber Lofthouse, and was the owner of Paa Farm Paythorne, Clitheroe, which had been in his family for over 250 years. My grandmother Mabel Margret Lofthouse was to inherit the property, but she moved to Canada in the early 1900s, and chose not to move back to England and so it got passed down to her sister.Anyhow, you talk about some of the Lofthouse’s that moved to Utah. Well I actually have a handwritten letter to my grandmother from one of her cousins that moved to Utah, talking about burying a relative (Alice) along the Mississippi, and births/deaths/marriages of a group of them. One of them married a Shaw, who was very involved in the Mormon Church. Anyhow, of coarse I am at work, and don’t remember everything. So can get more info if someone is interested… it is a priceless letter, because it has so much info.But I just wanted to say how the Lofthouse page was very interesting to read. One day I want to go to Paa Farm. One of my cousins have already done it. If you want to contact Lisa please contact this site. Letter from Sid Smith on 4th June 2014.Thought you might be interested in my Gene research.The marriage of Ethel Doreen, only daughter of Mr. and Mrs. Bert Ellis, of Charles-street, Prospect, to Charles, third son of Mr. and Mrs. C. G. Lofthouse, Yorkshire, England, will be solemnised at St. Cuthberts Church, Prospect, on Saturday, June 6th, at 7 p.m. Friends and Relatives cordially Invited to ceremony. No reception. …. The Chronicle Adelaide, South Australia 4 June 1931Ethel Ellis is my second cousin. would like to know full names of Charles Parents if you know same. If you can help Sid please contact the site. ABRAHAM LOFTHOUSE. Bap. 23.2.1772 Kirkby Malzeard. Son of William of Kirkby Malzeard. ADA LOFTHOUSE. Born C.1880 Manchester. Dau of Henry of Grewelthorpe. Butcher. ADA LOFTHOUSE. Born 13 Dec 1925. Dau of Fred Snowden Lofthouse & Annie.of Harper Hill Dallowgill. Later married ? Fawcett. ALBERT LOFTHOUSE. Born C.1848. Son of Andrew & Mary. ALFRED LOFTHOUSE. Born C. 1836 Dallowgill. Son of Michael the schoolmaster & Ann. ALFRED LOFTHOUSE. Bap. 12.7.1846 Laverton. Son of Willis & Jane. ALFRED LOFTHOUSE. Born C.1857 Cheshire. Son of Francis & Margaret. ALEXANDER LOFTHOUSE. Bap. 1.10.1853 Laverton. Son of Willis & Jane. ANDREW LOFTHOUSE. Born 14.11.1802 Dallowgill. Died 26.2.1876 Buried 29.2.1876. Son of Ralph & Margaret Mary Procter. Commercial carrier 1841. Farmer 1851. Cream cheese maker 1871. Husband of Mary Ann Blackburn. of Grewelthorpe. Had 8 children. ANN LOFTHOUSE. Born C. 1756. Lived Laverton. Buried 12.5.1842 Kirkby Malzeard. ANN LOFTHOUSE [nee MYERS]. Born C1764 Graycote, Kirkby Malzeard. Died Nov 1858. Buried 12.11.1858 Dallowgill. Wife of Ralph. Described as a pauper in 1851. ANN LOFTHOUSE. Born C.1768. Buried 16.11.1858 Dallowgill. Lived Fellbeck, Pateley Bridge. ANN LOFTHOUSE. Born 29.10.1797 Dallowgill. Dau of Ralph & Sarah Ashby. ANN LOFTHOUSE [Nee Lofthouse]. Born 25.12.1803 Lady Hill Farm Dallowgill. Died 25.11.1898 Paradise Utah. Dau of Ralph & Margaret Procter. Married Anthony Lofthouse. 1.2.1827. ANN LOFTHOUSE nee GRAHAM. Born C. 1810 Dallowgill. Died 20.1.1889 M.I. Dau of Alice Graham of Burton. Wife of Henry. ANN LOFTHOUSE. Born C.1821 Grewelthorpe. An inmate in Ripon Workhouse in 1871. An imbecile. ANN LOFTHOUSE. Born C1832 Kirkby Malzeard. Married Henry Buckle. ANNIE LOFTHOUSE [Nee?]. Born C.1848. Grewelthorpe. Buried 20.1.1914. M.I. Wife of Charles the joiner. Living Thorneycroft, Grewelthorpe in 1911. ANN LOFTHOUSE. Bap. 20.11.1859 Kirkby Malzeard. Died 1938. Australia. Illeg. dau of Martha of Kexmoor. Married Joseph Jackson of Pateley Bridge. .ANN LOFTHOUSE. Born 12.10.1869 Kirkby Malzeard. Dau of Martha Lofthouse. Grand dau of Robert & Martha Snowden. Ann was illeg. and raised by her grandparents. Robert & Jane. Ann married Joseph Jackson. they emigrated to Rockhampton, Queensland, Australia in C1913. ANN ELIZABETH LOFTHOUSE. Born C. 1860 Laverton. Dau of Francis & Margaret. ANN AMELIA LOFTHOUSE. Born 5.7.1890 Grewelthorpe.Dau of Peter & Amelia. Started Grewelthorpe school 12.8.1895. Left 1904. Living with parents in 1911, unmarried dressmaker. ANNIE LOFTHOUSE. Bap. 8.8.1892 Dallowgill. Dau of Thomas Edwin & Mary. Crosshills, Dallowgill. ANNIE LOFTHOUSE. Bap 14.1.1903 Dallowgill. Dau of Francis & Ellen Elizabeth of Ladyhill, Dallowgill. ANTHONY LOFTHOUSE Born 19.10.1800 Knott Farm Dallowgill. Died 17.3.1847 Clitheroe Lancs. Son of Ralph & Sarah Ashby. Married Ann Lofthouse. on 1.2.1827 Kirkby Malzeard. ARTHUR LOFTHOUSE. Born C. 1848 Dallowgill. Son of Michael the schoolmaster & Ann. AUDREY LOFTHOUSE. Born 27.6.1932. Bap. 5.6.1932 Dallowgill. Dau of Fred Snowden Lofthouse [The Gamekeeper] & Annie of Dallowgill. .BETSY LOFTHOUSE. Bap. 4.10.1846 Kirkby Malzeard. Dau of John [The Mason]& Mary Ann. BRIDGET LOFTHOUSE. Born 13.12.1809 Dallowgill. Died 4.8.1852 Winksley. Dau of Ralph & Sarah Ashby. BRIDGET LOFTHOUSE. born C1831 Dallowgill. Dau of Henry & Ellen Horner. Lived Bowes Farm Dallowgill. BRIDGET LOFTHOUSE. Born C. 1838 Kirkby Malzeard. Dau of John [The Mason] & Mary Ann of Wensley. Married Harry Prest b1836 Kirkby Malzeard. Ref. 1861 census. CAROLINE LOFTHOUSE. Bap. 5.10.1851 Dallowgill. Dau of Michael [The Schoolmaster] & Ann. CAROLINE LOFTHOUSE. Bap. 20.7.1856 Laverton. Dau of Willis & Jane. CATHERINE LOFTHOUSE. Born C. 1797. Lived Dallowgill. Buried 6.10.1842 Kirkby Malzeard. CATHERINE LOFTHOUSE. Born C 1828 Dallowgill. Dau of John & Elizabeth. CATHERINE LOFTHOUSE. Bap. 3.10.1852 Dallowgill. Buried 5.7.1853. Dau of Christopher [The Mason] & Mary. CHARITY LOFTHOUSE. Born 29.10.1757. Died 23.12.1757. Dau of George & Sarah Spence. CHARITY LOFTHOUSE. Born Dallowgill. Bap 20.6.1761 Kirkby Malzeard. dau of George & Sarah Spence. CHARLES LOFTHOUSE. Bap. 1.2.1774. Kirkby Malzeard.Died 5.10.1855. Buried 7.10.1855. M.I. Son of Christopher & Dorothy Gill. of Dallowgill. Married Sarah Stead. 13.5.1807 K.Malzeard. Charles was a stonemason. Made his will 30.8.1851. Will proved 9.6.1856. See photo of grave at end. CHARLES LOFTHOUSE. Born1791 Dallowgill. Son of Christopher & Elizabeth Earl. * Stonemason. Married Catherine Beck. [1792-1842]. Had 5 children. CHARLES LOFTHOUSE. Born C1811. Lived Dallowgill. Buried 29.8.1841 Kirkby Malzeard. Son of Charles [Stonemason] & *Sarah Stead. CHARLES LOFTHOUSE. Born 1835. Son of Charles [The Stonemason] & Catherine Beck. CHARLES LOFTHOUSE. Born C.1845 Grewelthorpe. Died 12.8.1924 M.I. Joiner.Son of Henry & Ann Graham. Husband of Ann. Married C.1869. Living Elm Cottage Grewelthorpe 1881. Charles was overseer for lowside in 1898. Living Thorneycroft Grewelthorpe in 1911. They had 6 children, 2 died. CHARLES GEORGE LOFTHOUSE. Born 1875 Sawley. Died 2.6.1955 Middlesbro. Son of Robert [The Farm Bailiff] & Henrietta Wright. Joiner. Married Clara Cordingley. [1877-1939] Yarm. Had 6 children. CHARLES LOFTHOUSE. Born 31.3.1905 Giling East. Son of Charles George [Joiner] & Clara Cordingley. *Married *Ethel Doreen Ellis in Australia. CHARLOTTE LOFTHOUSE.[Nee ?] Born C. 1856 Kirkby Malzeard. Wife of John of Warren Hill. CHRISTOPHER LOFTHOUSE. Born 1729. Died 1808. Son of George & Sarah Spence. married to Dorothy Gill. on 29.12.1760 Kirkby Malzeard. see photo of grave at end. CHRISTOPHER LOFTHOUSE. Born 1.4.1748. Son of George & Sarah Spence. CHRISTOPHER LOFTHOUSE. Born C. 1763. Lived Harper Hill. Buried 18.6.1843 Kirkby Malzeard. CHRISTOPHER LOFTHOUSE. Born C. 1795 Dallowgill. Son of Ralph & Ann Myers. [!841/51 census]*CHRISTOPHER LOFTHOUSE. * Born C. 1801 Dallowgill. Buried 4.2.1863 Dallowgill. Married Mary. Farmed Harper Hill Dallowgill. CHRISTOPHER LOFTHOUSE. Born C.1805. Buried 15.1.1876. Lived Harper Hill, Dallowgill. CHRISTOPHER LOFTHOUSE. Born C.1824 Dallowgill. Son of John & Elizabeth. Married Frances [Fanny] b.1839 Dallowgill. CHRISTOPHER LOFTHOUSE. Son of John the shoemaker. Christopher was a grocer lived at Greygarth. Widower when he married Ann Gill. on 27.8.1859 at Kirkby Malzeard church. Ann was a widow. Dau of Henry Gill. the Chandler. CHRISTOPHER LOFTHOUSE. Born 1826. Son of Charles [The Stonemason] & Catherine Beck. CHRISTOPHER LOFTHOUSE. Bap. 2.3.1851 Dallowgill. Buried 8.11.1901 Dallowgill. Son of Christopher & Mary of Harper Hill Dallowgill. CHRISTOPHER LOFTHOUSE. Bap. 5.3.1865 Dallowgill. Son of John [The Cordwainer] & Jane. CLARA LOFTHOUSE. Born 18.8.1908 Darlington. Died 17.7.2003 Middlesbro. Dau of Charles George [Joiner] & Clara Cordingley. Married John William Watson. [b 5.9.1906 Stockton on Tees.died 25.2.1965 Middlesbro.] Had 3 children. DOROTHY LOFTHOUSE [Nee Gill]. Born 1733. Died 1817. Married Christopher 29.12.1760 Kirkby Malzeard. DOROTHY LOFTHOUSE. Born C. 1804. Buried 7.3.1857 Dallowgill. DOROTHY ANN LOFTHOUSE. Born C1860 Dallowgill. Dau of John [the Cordwainer] & Jane. DOUGLAS ROBERT LOFTHOUSE. Born 25 July 1927. Buried 4.8.1987. Son of George & Jane. Husband of Phyllis Bowen. Married North Stainley 1954. EDITH LOFTHOUSE. Born 30.4.1879. Dressmaker 1901. Dau of Charles & Annie. Started Grewelthorpe school 20.4.1885. Left 1894. Married George Thirkill. A Joiner of Grewelthorpe in 1904. EDITH ANNIE LOFTHOUSE. Bap. 6.6.1883 Dallowgill. Dau of John & Anne of Beckmeetings. Dallowgill. EDWARD LOFTHOUSE. Bap 1805 Grewelthorpe. Son of John of Dallowgill. Married Ann Crawford. of Scorton. on 18.3.1826. See history at end of page. EDWARD LOFTHOUSE. Born C.1861 Hindley, Wigan. Son of Henry & Elizabeth Crow. ELLENAR[D] LOFTHOUSE. Born 1869 Ripley. Dau of Robert [Farm Bailiff] & Henrietta Wright. ELEANOR LOFTHOUSE. Bap. 13.4.1894 Dallowgill. Dau of John & Anne of Beckmeetings, Dallowgill. ELIJAH LOFTHOUSE. Born C.1842. Buried 17.3.1863 Dallowgill. Lied Greygarth, Dallowgill. ELIZABETH LOFTHOUSE. Born C. 1756. Wife of Henry. Lived Masham. ELIZABETH LOFTHOUSE. Born 1767 Dallowgill. Died 19.3.1859. Dau of George [1746-1790] & Ellen Johnson.[1743-1786]. Married Robert Allinson. of Dallowgill in 1787. Had 11 children. ELIZABETH LOFTHOUSE. Bap. 15.1.1771 Kirkby Malzeard. Dau of Tristram of Galphay. ELIZABETH LOFTHOUSE. Bap. 18.2.1775.Kirkby Malzeard. Died 5.9.1866. Dau of George & Ellen Johnson. of Dallowgill. Married Thomas Shaw. ELIZABETH LOFTHOUSE [nee ?]. Born C.1794 Grewelthorpe. Buried 22.2.1874 Dallowgill. Wife of John of Dallowgill . Widow in 1861. ELIZABETH LOFTHOUSE. married 24 May 1914 in Masham to Simon Pickersgill. ELIZABETH LOFTHOUSE. Born C. 1827 Dallowgill. Died 1918. age 91. Married  Matthew Ingleby. In 1847. Married  James Cundall. in 1877. Lived Kirkby Malzeard. In 1901 she was in the Alms Houses in K.Malzeard. James had previously been married to Ellen Ascough. see Ascough page. ELIZABETH LOFTHOUSE. Born C. 1840 Dallowgill. Buried 24.3.1842 Kirkby Malzeard. ELIZABETH LOFTHOUSE. Born C. 1842 Dallowgill. Dau of Michael the schoolmaster & Ann. ELIZABETH LOFTHOUSE. Bap. 7.6.1891 Dallowgill. dau of John & Anne. Beckmeetings, Dallowgill. ELLEN LOFTHOUSE. Born C1751. Lived Galphay. Buried 26.11.1841 Kirkby Malzeard. ELLEN LOFTHOUSE. Bap. 21.11.1767 Kirkby Malzeard. Died 21.12.1834. Dau of George & Ellen Johnson. of Dallowgill. ELLEN LOFTHOUSE. Born 1.10.1790. Died 19.6.1863. Dau of Ralph & Sarah Ashby. ELLEN LOFTHOUSE. Born C.1800. Buried 18.6.1880 Dallowgill. Lived Grantley. EMILY JANE LOFTHOUSE. Bap. 7.3.1847 Dallowgill. Dau of Henry & Margaret. Farmer at Knott Dallowgill. EMMA LOFTHOUSE. Born C..1844 Dallowgill. Dau of Michael [the schoolmaster] & Ann. EMMA LOFTHOUSE. Bap. 27.11.1870 Dallowgill. Dau of Christopher & Fanny of Lady Hill. ERNEST ARTHUR LOFTHOUSE. Born 31.3.1872 Manchester. Died 29.4.1891. Buried 2.5.1891. M.I. Son of Charles & Annie. Started Grewelthorpe school 13.11.1876. Left 1884. ERNEST LOFTHOUSE. Born 23.4.1928. Bap. 27.5.1928 Dallowgill. Son of Fred Snowden Lofthouse [The Gamekeeper] & Annie of Wakehill, Dallowgill. ETHEL M.LOFTHOUSE. Born 19 March 1889. widow living Kirkby Malzeard in 1939. EVA ALICE LOFTHOUSE. Born 6.11.1896. Grewelthorpe.Dau of Peter & Amelia. Started Grewelthorpe school 7.5.1900. Living with parents in 1911 in Grewelthorpe. FAITH LOFTHOUSE. Born 14.6.1753. Dau of George & Sarah Spence. FRANCES LOFTHOUSE. Born C. 1771. Buried 12.5.1847 age 76. Lived Greygarth. FRANCES ANNE LOFTHOUSE. Bap. 3.6.1849. Dau of Michael [the schoolmaster] & Ann. Dallowgill. FRANCIS LOFTHOUSE. Born C.1826 Laverton. Ag. Labourer at Quarry House, Azerley in 1861. Husband of Margaret of Laverton. FRANCIS LOFTHOUSE. Bap. 12.10.1864 Kirkby Malzeard. Son ofFrancis [Husbandman] & Margaret of Laverton Quarry. FRANK LOFTHOUSE. Born C.1825. Buried 13.9. 1897. Dallowgill. Lived LadyHill, Dallowgill. FREDERIC LOFTHOUSE. Bap 19.4. 1840. Son of Henry & Ellen Horner lived Bowes Farm Dallowgill. FRED LOFTHOUSE. Born 26.10.1866. Son of Robert & Jane Atkinson of Kirkby Malzeard. Came to Grewelthorpe school from Kirkby Malzeard 19.5.1879. Left 1880. Living with his aunt Alice Atkinson in 1911. FRED LOFTHOUSE. Born C. 1876 Kirkby Malzeard. Son of Bridget.& John. Stepson of David Suttill. Carter in 1901 at Gate Bridge Mill, Azerley. Married on 11.4.1903 at Kirkby Malzeard to Elizabeth Ingleby. [b. 1876] dau of Wilfred Ingleby. FREDERICK SNOWDEN LOFTHOUSE. Bap.25.12.1884 Galphay. Son of John Walmsley & Charlotte. FRED SNOWDEN LOFTHOUSE. Born 19 June 1890. Bap. 31.8.1890 Dallowgill. Son of Thomas Edwin [The Watcher] & Mary. Crosshills, Dallowgill. He was a Farmer and Gamekeeper. Married to Annie [born 1894]. Living Harper Hill in 1939. FREDA LOFTHOUSE. Born 9.6.1930. Bap. 3.8.1930 Dallowgill. Dau of Fred Snowden Lofthouse [The Gamekeeper] & Annie of Wakehill, Dallowgill. GEORGE LOFTHOUSE. Born 11 Sept.1714. Dallowgill. Died 24.1.1790. Son of George. Married  to Sarah Spence. on 28.9.1741 Kirkby Malzeard. Married  to Eleanora [Ellen] Johnson. 2.2.1763. George was a yeoman and farmer at Knotts Farm. GEORGE LOFTHOUSE. Born 1746. Died 1790. Married Catherine Steel on 10.2.1777. Son of George & Sarah Spence. Had 6 children. GEORGE LOFTHOUSE. Born 29.3.1795 Dallowgill. Died 20.3.1863 Rimington. Son of Ralph & Sarah Ashby. GEORGE LOFTHOUSE. Born C.1824 Warsill. Unmarried shoemaker living Laverton in 1871. This could be the George Lofthouse age 78 who was buried at Dallowgill 9.2.1901. GEORGE LOFTHOUSE. Born C.1836 Dallowgill. Son of John & Elizabeth. GEORGE LOFTHOUSE. Bap. 8.7.1849 Kirkby Malzeard. Son of John [The Stonemason] & Mary Ann. GEORGE C. LOFTHOUSE. Born 1 Jan 1881. A widower in 1939 living at Black a Moor Inn Risplith. He was a joiner. GEORGE HENRY LOFTHOUSE. Born 2.2.1893 Grewelthorpe. Son of Peter & Amelia. Started Grewelthorpe school 14.3.1898. A shopkeeper in Grewelthorpe. Kellys Directory 1936. In 1939 register he was listed as a Painter & Decorator. Married to Jane. GEORGE H. LOFTHOUSE. Born 10 March 1925. Son of Ethel M. In 1939 he was a chemists errand boy. GORDON LOFTHOUSE. Born 17.2.1922. Bap. 19.3.1922 Dallowgill. Son of Fred Snowden Lofthouse [The Gamekeeper]& Annie. of Wakehill, Dallowgill. HANNAH LOFTHOUSE. Born C. 1850 Grewelthorpe. Dau of Robert & Jane. HAROLD JOHN LOFTHOUSE. Born 28.3.1882 Grewelthorpe. Son of Charles & Ann. Started Grewelthorpe school 16.1.1888. Left 1895. Joiners apprentice working for Samuel Learoyd of Staveley. 1901. HARRY LOFTHOUSE. Born C.1903. Buried 3.6.1906.M.I. Drowned, Son of Alfred & Annie of Biggin Hill. HARRIET LOFTHOUSE. Bap. 14.10.1849. Kirkby Malzeard. Dau of Robert & Jane of Kexmoor. HARRIET LOFTHOUSE. Born 2.1.1867. Bap. 10.2.1867 Dallowgill. Dau of Christopher & Fanny of Lady Hill. HELEN LOFTHOUSE. Born C.1799 Masham. Dau of Henry & Elizabeth. Wife of Thomas Hammond. HENRIETTA LOFTHOUSE. Bap 13.6.1837. Dau of Henry & Ellen Horner. of Bowes Dallowgill. HENRY LOFTHOUSE. Born C.1756. Husband of Elizabeth. Lived Masham. Father of Helen. HENRY LOFTHOUSE. Born 2.5.1763 Dallowgill. Son of George & Ellen Johnson. HENRY LOFTHOUSE. Born 8.12.1799 Dallowgill. Died 6.4.1867. Son of Ralph & Sarah Ashby. Married Ellen Horner. on 14.4.1819. Brother of Robert who was murdered by his wife Ursula. HENRY LOFTHOUSE. Born C.1800. Buried 6.4.1867 Dallowgill. Lived Grantley. HENRY LOFTHOUSE. Born 1815. Son of Charles [stonemason] & Sarah Stead. HENRY LOFTHOUSE. Born C. 1815 Grantley. Died 7.7.1901 M.I. Joiner, Master Carpenter, Cream cheese maker & grocer. Husband of Ann Graham. Widower in 1901. Trustee of Dallowgill chapel . Excerpt from newspaper [no date known]. In Grewelthorpe about 100 years ago Henry Lofthouse made the first cream cheese from cream he collected in Dallowgill,Galphay and Winksley. At 4a.m. in his light spring cart he would rattle through to catch the first train from Ripon for Leeds and London. Report in York Herald 1867 where Henry Lofthouse is selling timber. HENRY LOFTHOUSE. Born C.1818. Buried 31.10.1896 Dallowgill. Lived Ripley. HENRY LOFTHOUSE. Born 24.4.1840. Galphay. Son of Robert & Martha Snowden. Henry married Eizabeth Crow. [b.1837] dau of John Crow the weaver. On 26.11.1860 in Hindley, Wigan. She was born in Isle of Man. Henry was a collier. HENRY LOFTHOUSE. Born C.1855 Grewelthorpe. Son of Francis & Margaret. Living Manchester 1891. a widower and a Butcher. Had a dau. Ada in 1880. HERBERT LOFTHOUSE. Bap. 12.5.1878 Dallowgill. Son of Thomas Edwin [The Watcher] & Mary, Crosshills Dallowgill.HOPE LOFTHOUSE. Born 4.4.1755. dau of George & Sarah Spence. ISAAC LOFTHOUSE. Born C.1797. Buried 7.2.1882 Dallowgill. Lived Glasshouses, Pateley Bridge. married  Ellen Barker. of Dallowgill. b.1797 d.1863. married in 1871 to  Mary Bentley. of Ripon. ISABELLA E. LOFTHOUSE. Born 1840 Coverham. Dau of Robert & Ann Wilson. married William J. Ellis. [stonemason] see Ellis page. JACOB LOFTHOUSE. Born C. 1864. Illeg. son of Martha Lofthouse. 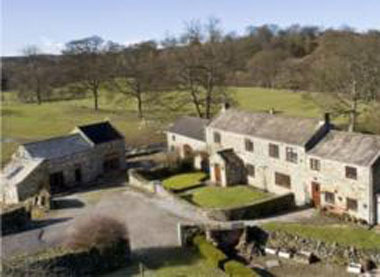 Lived at South Oaks Farm, Fellbeck. JAMES LOFTHOUSE. Born C. 1844. Died 1853. Son of Andrew & Mary. JAMES LOFTHOUSE. Bap. 22.6.1851 Dallowgill. Buried 1.8.1851. Son of Christopher [the Mason] & Mary. JANE LOFTHOUSE. Born C. 1808 Dallowgill. Wife of Robert. JANE LOFTHOUSE. Born C.1820 Grewelthorpe. Buried 3.1.1869 Dallowgill. Lived Bowes. Wife of Willis. JANE LOFTHOUSE. Born C1833. dau of John & Elizabeth Allanson. In 1851 married George Simpson.[b1830]. Had 1 son Geo. Wm. JANE LOFTHOUSE. Born C. 1842.Buried 18.12.1865. Dau of Andrew & Mary. JANE LOFTHOUSE. Born C. 1852 Grewelthorpe. Dau of Henry & Ann Graham. JANE ELIZABETH LOFTHOUSE. BAP. 20.3.1853. Laverton. Dau of Willis & Jane. JANE LOFTHOUSE. Bap. 14.8.1853. Grewelthorpe. Dau of Robert & Jane Snowden. of Kexmoor. JANE LOFTHOUSE of Grewelthorpe Married Frederick Tomlinson a Grantley schoolmaster on July 8th 1876. at Ripon Cathedral. [Ref. Knaresborough Post 1876]. JANE ELIZABETH LOFTHOUSE. Bap. 5.10.1862 Dallowgill. Dau of Christopher & Frances [Fanny] of Lady Hill. Grand dau of Elizabeth Lofthouse b.1794. JANE E. LOFTHOUSE. Born C. 1878 Kirkby Malzeard. Grand dau of Richard Lambert. A Grocers assistant in 1891 in Kirkby Malzeard. JAMES LOFTHOUSE. Born 1844. Buried 21.6.1853. M.I. Son of Matthew & Mary. JESSIE LOFTHOUSE. Born 2.2.1900 Yarm. Died 5.5.1995 Solihull. Dau of Charles George [joiner] & Clara Cordingley. JOHN LOFTHOUSE. Of Bedale. The following item taken from www.selectsurnames.com. In 1450 the court heard that John Lofthouse of Bedale had taken 20 beasts belonging to the lord of the manor and another 40 belonging to Thomas Rand of Crakehall and kept them in Bedale for two days and nights.He admitted that he had taken six oxen of Thomas Rand’s that had been breaking down the hedges in the field in which they were kept, but he seems to have claimed that the other cattle had strayed onto his land and that he in fact had saved their owners money by feeding him with his own corn “to the loss of his own beasts.” He clearly believed that attack was the best form of defence!He disclaimed all responsibility for the straying of 160 sheep from Rand and the jury agreed that he was not to blame. The case turned out to be a storm in a teacup. John was merely put on good behavior for a year and two friends stood surety for him. JOHN LOFTUS. 10.6.1669. Married Anna Smorthwaite. of Nutwith Cote. JOHN LOFTHOUSE. Born C. 1751. Lived Laverton. Buried 29.5.1821. Kirkby Malzeard Par. reg. JOHN LOFTHOUSE. A Cordwainer married on 2.6.1796 at Kirkby Malzeard to Frances Carling. Witness Mary Lofthouse. JOHN LOFTHOUSE. Born C.1792 Dallowgill. Buried 19.1.1856. Dallowgill. Farmer at Lady Hill, Laverton in 1851. Husband of Elizabeth Allanson. [1794-1874] of Grewelthorpe. JOHN LOFTHOUSE. Born 7.6.1807 Dallowgill. Died 4.8.1852 Kirkby Malzeard. Son of Ralph & Sarah Ashby. JOHN LOFTHOUSE. Born C.1825 Dallowgill. Buried 30.4.1883 Dallowgill. Married Jane. Lived Low Ray Carr, Laverton. Cordwainer. 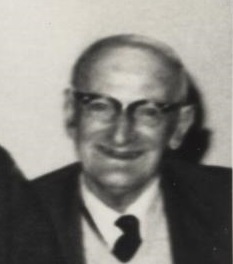 Modern photo of Low Ray Carr. Laverton. JOHN LOFTHOUSE. Born 1829. Son of Charles [The stonemason] & Catherine Beck. JOHN LOFTHOUSE. Born 3.7.1830. Died 29.4.1905 Utah. Son of Anthony & Ann Lofthouse. JOHN LOFTHOUSE. Born C.1850. Son of Andrew & Mary. Married Mary. JOHN LOFTHOUSE. Bap. 5.10.1851 Dallowgill. Son of John [The Cordwainer] & Jane. JOHN WALMSLEY LOFTHOUSE. Bap. 5.12.1852 Dallowgill. Son of Christopher & Mary of Harper Hill. JOHN LOFTHOUSE. Born C. 1853 Kirkby Malzeard. Farmer at Warren Hill, Azerley. Married to Charlotte born 1856 Kirkby Malzeard. Ref. 1881 Census. Azerley. JOHN LOFTHOUSE. Bap.27.5.1858 Kirkby Malzeard. Son of Francis & Margaret of Laverton. JOHN LOFTHOUSE. Born C.1868 Leeds. Son of Henry & Elizabeth Crow. JOHN THOMAS WILLIS LOFTHOUSE. Bap 29.10.1882 Dallowgill. Son of Reuben & Jane Ann. of Bowes House Dallowgill. JOHN HENRY LOFTHOUSE. Bap. 16.1.1907 Mickley. Son of Francis & Ellen Elizabeth.JOHN LOFTHOUSE. Born 9.4.1924. Bap.11.5.1924 Dallowgill. Son of Fred Snowden Lofthouse [The Gamekeeper] & Annie of Wakehill, Dallowgill. JOSEPH LOFTHOUSE. Bap. 9.8.1772. Kirkby Malzeard. Died 26.12.1845. Son of George & Ellen Johnson. of Dallowgill. A Joseph Lofthouse b1773 in Yorkshire was imprisoned in 1836 for 2 months for larceny. Not sure if this is him. JOSEPH LOFTHOUSE. Born C. 1845 Dallowgill. Grandson of John & Elizabeth. JOSHUA LOFTHOUSE. Bap. 28.5.1853 Laverton. Son of Christopher & Mary. Farm servant 1871 working for Robert & Ann Thackray. Died Dec 1937 age 84. Funeral at St Peter’s Church Dallowgill. Farmed all his life at Harper Hill Dallowgill. KATE LOFTHOUSE. Born 1872 Sawley. Dau of Robert [The Farm Bailiff] & Henrietta Wright. MABEL EDITH LOFTHOUSE. Bap 5.5.1886 Dallowgill. Dau of Thomas Edwin [the Watcher] & Mary. MARGARET LOFTHOUSE. Born 17.4.1744 Dallowgill. 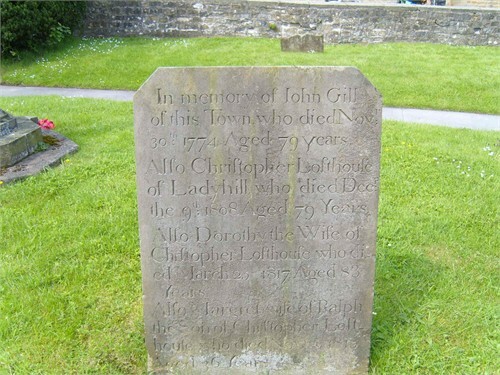 Died 16.1.1766 Dallowgill. Dau of George & Sarah Spence. MARGARET LOFTHOUSE. Bap. 11.9.1814 Dallowgill. Dau of Ralph & Sarah Ashby. MARGARET LOFTHOUSE. Born C.1823. Buried 10.4.1895 Dallowgill. MARGARET LOFTHOUSE. Born C.1829 Laverton. Wife of Francis. MARGARET LOFTHOUSE. Born C.1847. Dau of Andrew & Mary. Probably the wife of Henry Jackson of Lofthouse see 1881 census. MARGARET LOFTHOUSE. Born C1862 Dallowgill. Dau of John [The Cordwainer] & Jane. MARGARET LOFTHOUSE. Born C.1864. Buried 14.1.1889 Dallowgill. Lived Ladyhill Dallowgill. MARGARET LOFTHOUSE. Bap.2.8.1863 Kirkby Malzeard. Dau of Francis & Margaret of Laverton. MARGARET LOFTHOUSE. Born 20.11.1930 Died 29.12.1996 Middlesborough. Dau of Clara & John Wm. Watson. MAGGIE LOFTHOUSE. Bap. 29.4.1888 Dallowgill. Dau of John & Anne of Beckmeetings, Dallowgill. MARIA LOFTHOUSE. Bap 26.1.1834. Dau of Henry & Ellen Horner. of Dallowgill. MARIA LOFTHOUSE. Born C.1852 Grewelthorpe. Dau of Andrew & Mary. Sister of Margaret Jackson nee Lofthouse.1881 census. MARTHA LOFTHOUSE [Nee SNOWDEN] Born C. 1808. Dau of Esther Snowden. [born 1773 died June 1850].Married to Robert Lofthouse. She committed suicide in Dec 1844 by taking poison in a temporary fit of madness. Buried 11.12.1844 Kirkby Malzeard. Her sister Jane lived with Robert after Martha’s death. See newspaper report at end. MARTHA LOFTHOUSE. Born C. 1843. Grewelthorpe. Dau of Robert & Martha Snowden. Martha had 2 illeg. children. 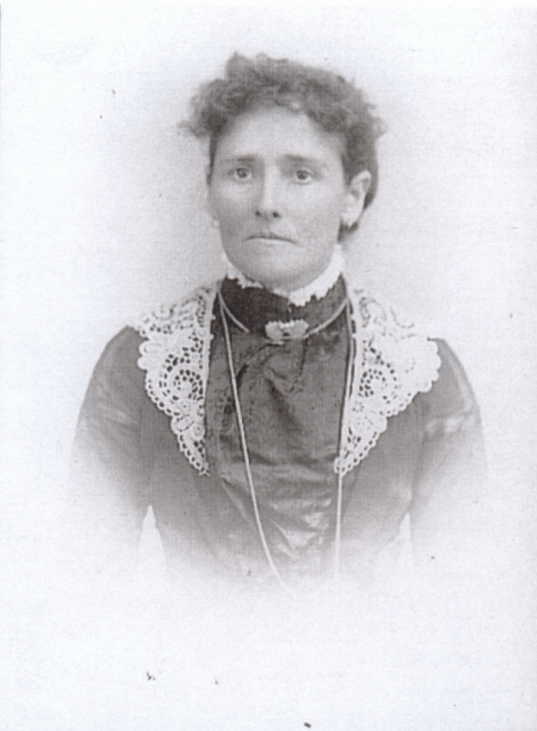 Ann b.1859. & Jacob Lofthouse b.C1864. Banns read [Grewelthorpe]for marriage to Thomas Rawson of Healey. November 1865. MARY LOFTHOUSE. Born 1718 Dallowgill. Dau of Ralph. MARY LOFTHOUSE. Bap. 6.1.1778 Kirkby Malzeard.Dau of Christopher of Dallowgill. MARY ANN LOFTHOUSE [nee ?]. Born C. 1811 Wensley.Married John [the mason]. Widowed in 1861 living K.Malzeard with dau Bridget. MARY LOFTHOUSE [nee ?]. Born C.1812 Grewelthorpe. Married Andrew Lofthouse. on 22.2.1838 Kirkby Malzeard. MARY LOFTHOUSE. Born C1814 Dallowgill. Dau of John & Elizabeth. MARY LOFTHOUSE. Born C.1814. Buried 4.5.1849 Mickley.This could be Mary dau. of Charles & Sarah Stead. MARY ANN LOFTHOUSE. Born C.1812 Grewelthorpe. Buried 15.10.1878. Wife of Andrew. MARY LOFTHOUSE. Born C.1822. Buried 8.8.1893 Dallowgill. Lived Harper Hill. MARY ANN LOFTHOUSE. Born C.1829. Buried 9.4.1882 Dallowgill. Lived Beck Meetings, Dallowgill. MARY ANN LOFTHOUSE. Born C.1845 Grewelthorpe. Dau of Andrew & Mary. MARY ANN LOFTHOUSE. Bap. 29.4.1849 Dallowgill. Dau of Christopher & Mary of Harper Hill, Dallowgill. MARY LOFTHOUSE. Bap. 27.5.1849 Dallowgill. Dau of John [the Cordwainer] & Jane. MARY ANN LOFTHOUSE. Born C.1850. Grewelthorpe. Dau of Henry & Ann Graham. MARY LOFTHOUSE. Bap. 5.6.1854 Kirkby Malzeard. Dau of Ralph [The Tailor] & Rebecca. MARY JANE LOFTHOUSE. Born 16,6,1874 Grewelthorpe. Died 26.12.1946.. Dau of Charles & Annie. Started Grewelthorpe school 22.7.1878. Servant in Ripon in 1891. See Obit at end. MATILDA LOFTHOUSE. Bap. 23.6.1844 Kirkby Malzeard. Buried 7.11.1847 Dallowgill. Dau of Henry & Ellen of Dallowgill. MATILDA LOFTHOUSE. Bap.27.2.1848 Dallowgill. Dau of Willis & Jane. Lived Bowes Farm. Dallowgill. MATTHEW LOFTHOUSE. Born 19.12.1742. Dallowgill. Son of George & Sarah Spence. MATTHEW LOFTHOUSE. Born C. 1789 Dallowgill. Buried 4.7.1874 Dallowgill. Brother of Christopher. A Broom maker in 1861. Lived Harper Hill, Dallowgill. MATTHEW LOFTHOUSE. Born 1832. Son of Charles [Stonemason] & Catherine Beck. MAURICE LOFTHOUSE. Born 9.2.1903 Gilling East. Son of Charles George [Joiner] & Clara Cordingley. MICHAEL LOFTHOUSE. Born C.1812 Dallowgill. Schoolmaster at Dallowgill school. Husband of Ann of Dishforth. 8 children in 1851. NOEL LOFTHOUSE. Bap. 25.1.1913 Mickley. Son of Francis & Helen Elizabeth. PETER LOFTHOUSE. Born 1809. Grantley. Son of Charles [The stonemason] & Sarah Stead. Married Sarah Raper. in 1841 in Surrey. PETER LOFTHOUSE. Born 1838. Galphay. Buried 17.3.1839 Kirkby Malzeard. PETER LOFTHOUSE. Born C. 1847. Grewelthorpe. Son of Henry & Ann Graham. Grocer living The Green Grewelthorpe 1901. Husband of Amelia of Dallowgill. Married C.1890. Peter was a Grewelthorpe Parish Councillor from 1901 to 1904. He was an overseer for lowside until 1905. In 1911 he was a grocer & meal & corn dealer. living Grewelthorpe with 3 children. PHYLLIS LOFTHOUSE [Nee Bowen]. 5th Dau of J.C.Bowen of North Stainley. Married Douglas Robert Lofthouse in July 1954 at North Stainley Parish Church. PRISCILLA LOFTHOUSE. Bap 15 June 1851 Dallowgill. Dau of Willis & Jane. Married John West in 1875. RALPH LOFTHOUSE. Married Margaret Appleby. RALPH LOFTHOUSE. Bap. 21.12.1760 Dallowgill. Died 20.8.1841. Buried 23.8.1841 Kirkby Malzeard. Son of Ralph & Margaret Appleby. Married Ann Myers. of Kirkby Malzeard on 9.12.1790 at Kirkby Malzeard. RALPH LOFTHOUSE. Born 15.12.1765 Dallowgill. Died 26.12.1845. Buried 31.12.1845 Kirkby Malzeard. Son of George  & Eleanor Johnson. b.1743. Married Sarah Ashby. 7.4.1790 Kirkby Malzeard. [See Ashby Page]. Had 10 children. RALPH LOFTHOUSE. Born 8.5.1769 Dallowgill. Died 3.2.1855 Dallowgill. Son of Christopher & Dorothy Gill. Married Margaret Mary Procter. on 11.12.1799 Kirkby Malzeard. Father in law of Thomas Ashby. on 1851 census. Laverton. Lived LadyHill. RALPH LOFTHOUSE. Victualler at “Barrell” Dallowgill. 1822 directory. REUBEN LOFTHOUSE. Bap. 25.12.1849 Laverton. Son of Willis & Jane. Married Jane Ann Hewitson of West Hartlepool in 1875. ROBERT LOFTHOUSE. Bap. 7.11.1769. Kirkby Malzeard. Son of George & Ellen Johnson. of Dallowgill. ROBERT LOFTHOUSE. Born 26.2.1805 Dallowgill. Died 8.11.1834. Son of Ralph & Sarah Ashby. Married Ursula Johnson in 1832. She poisoned him and was executed on 6.4.1835. after a trial at York. See Newspaper report at end. ROBERT LOFTHOUSE. Born C. 1813. Kirkby Malzeard. Farmer at Kexmoor 1851. !st wife Martha Snowden. she committed suicide [took poison] in Dec 1844. Robert then lived with Martha’s sister Jane Snowden. they had 3 children [illeg.] Maria, Harriet & Jane jnr.Robert lived with his son William in Kirkby Malzeard in 1891. ROBERT LOFTHOUSE. Born C.1814 Carlton. Son of John [b.1770]& Elizabeth. [1774-1866] Married Ann Wilson. of Bishop Aukland. ROBERT LOFTHOUSE. Born 1838. Died 6.1.1914 Sawley. Son of Charles [The Stonemason] & Catherine Beck. Farm Bailiff. Married Henrietta Wright. [b.1843 Laverton] Had 3 children. In 1901 he was a woodman. ROBERT LOFTHOUSE. Born C.1848. Buried 6.8.1858. ROBERT HENRY LOFTHOUSE. Born 28.11.1899 Ripon. Killed in action Flanders on 2.9.1918. Son of Charles George [the joiner] & Clara Cordingley. RONALD LOFTHOUSE. Born 28.11.1915 Middlesborough. Son of Charles George [The joiner] & Clara Cordingley. SARAH LOFTHOUSE [nee Spence]. Born 1718. Died 1761. After having 9 children. Married On 28.9.1741 to George [1714-1790]. SARAH LOFTHOUSE. Born 14.2.1752. Dau of George & Sarah Spence. SARAH LOFTHOUSE [Nee Stead]. Born 18.9.1774. Acaster Malbis. York. Died 29.1.1863. Grewelthorpe. married Charles on 13.5.1807 at Kirkby Malzeard. see photo of grave at end. SARAH LOFTHOUSE. Born C. 1769. Lived Dallowgill. Buried 31.5.1840 Kirkby Malzeard. SARAH LOFTHOUSE. Born C.1775. Died 29.1.1863. M.I. Wife of Charles. SARAH LOFTHOUSE. Born 23.12.1792 Dallowgill. Died 12.8.1841 Kirkby Malzeard. Dau of Ralph & Sarah Ashby. SARAH MARGARET LOFTHOUSE. Bap.28.3.1900 Dallowgill. Dau of Francis & Ellen Elizabeth of Ladyhill Dallowgill. SELINA ANN LOFTHOUSE. Bap. June 1851 Dallowgill. Dau of Henry & Margaret of Knotts, Dallowgill. SOPHIA M. LOFTHOUSE. Born C. 1839 Dallowgill. Dau of Michael the schoolmaster & Ann. STANLEY LOFTHOUSE. Born 5.12.1915. Grandson of Peter. Started Grewelthorpe school 9.4.1923. Left 1929. In 1939 register listed as a worker in road stone quarry. Served in WW2. RAF. THOMAS LOFTHOUSE. In 1742/3 he was paid for 12 days work clearing out the debris from a closed pit at Speedwell Gin Shaft in Colsterdae. THOMAS LOFTHOUSE. Born C. 1840 Grewelthorpe. Buried 28.12.1869. Son of Andrew & Mary. THOMAS LOFTOUSE. Born C.1845 Grewelthorpe. Died 3.5.1856. M.I. Son of Henry & Ann Graham. THOMAS LOFTHOUSE. Born 19.5.1863 Hindley, Wigan. Son of Henry & Elizabeth Crow. THOMAS EDWIN LOFTHOUSE. Born 4.11.1877. Grewelthorpe. Bap 23.5.1847 Dallowgill. Died 16.5.1902. Son of Charles & Mary. Started Grewelthorpe school 9.4.1883. Left 1890. Re-admitted 1893. Lived Harper Hill Dallowgill. Was a Watcher. VIOLET LOFTHOUSE. Born C1905 South Stainley. Grand dau of Albert Atkinson & Fanny Harker. living in South Stainley in 1911. Mother would be Alice Emily or Annie Elizabeth Atkinson. WALTER HENRY LOFTHOUSE. Born 15.8.1869 Manchester. Son of Charles & Annie. Started Grewelthorpe school 13.11.1876. Left 1883. WILLIAM LOFTHOUSE. Bap. 7.11.1767 Kirkby Malzeard. Son of William of K.Malzeard. WILLIAM LOFTHOUSE. Born C. 1830. Son of John the Mason of Kirkby Malzeard. William was a Mason. married on 6.1.1855 at Kirkby Malzeard church to Maria Frankland. [b.1826] dau of Frank Frankland. of Kirkby Malzeard. WILLIAM LOFTHOUSE. Born 1835. Galphay. Son of Robert & Martha Snowden. WILLIAM LOFTHOUSE. Born C.1837 Kirkby Malzeard. Hawker. Son of Robert [b.1813]. WILLIAM ARTHUR LOFTHOUSE. Bap. 4.7.1847 Dallowgill. Son of Michael [the schoolmaster] & Ann. WILLIAM HENRY LOFTHOUSE. Born C.1871 Leeds. Son of Henry & Elizabeth Crow. WILLIS LOFTHOUSE. Bap 28.1.1821 Laverton. Buried 1.2.1880.Dallowgill. Son of Henry & Ellen. Grocer & Farmer. In 1841 he was a man servant at Dallowhall, Laverton. Husband of Jane of Grewelthorpe Married 1843. Widower in 1871. Living Bowes Laverton. ZILLAH LOFTHOUSE. Born C. 1838 Dallowgill. Dau of Michael the schoolmaster & Ann. Married Edwin George Grainge. ZILLAH LOFTHOUSE. Bap. 7.10.1860 Dallowgill. Dau of Christopher & Mary of Harper Hill. Grave of Christopher Lofthouse [1729-1808] & Dorothy nee Gill. 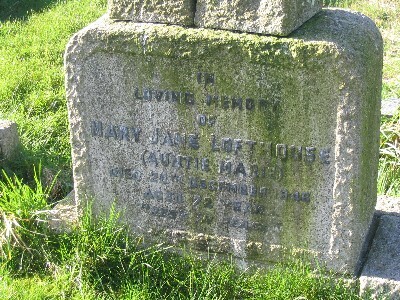 Graves of Mary Jane Lofthouse, and Charles & Sarah Lofthouse in Grewelthorpe Churchyard. Obituary for Mary Jane Lofthouse. as reported in Ripon Gazette 2nd Jan 1947.The death occurred last week in a Ripon Nursing Home of Miss Mary Jane Lofthouse age 72. She was the elder daughter of the late Mr & Mrs C. Lofthouse. of Grewelthorpe. Miss Lofthouse lived for many years at Leicester and she retired to Grewelthorpe 7 years ago. She was an active worker for the Red Cross in the 1st World War, of a gentle disposition Miss Lofthouse contributed to various causes chiefly in connection with The Methodist Church. Being a semi invalid since her retirement she was very fond of reading and an excellent conversationaslist and will be much missed by her many friends. The funeral was held at the Methodist Church last Saturday and her cousin Mr. George Lofthouse. played the organ. Chief mourners included Mr & Mrs George Thirkill. brother in law and sister. and Mr & Mrs Raymond Thirkill. nephew & Niece. This history and the following photographs have been sent by Barbara Lofthouse. Thanks to her for this information. A short history Lofthouses removed from Grewelthorpe. Barbara Lofthouse of Leicester is searching for her line of Lofthouses. So far she’s found out the following information regarding descendants but would very much like to further trace her proud Yorkshire roots backwards from the first ancestor listed.Edward Lofthouse. was born circa 1804. In most census material he is recorded as being born in ‘Firby’ but in one (1861) this is ‘Gulethorpe’. As a result of an initial trawl of maps and then with very much help from the editor of the Grewelthorpe website I now know that the latter is almost certainly Grewelthorpe There is a record of his baptism in Grewelthorpe in 1805, his father being one John Lofthouse of Dallowgill. However the family then moved to Firby near Bedale. On 18 March 1826 at St Cuthbert’s Church, Darlington, Edward was married to Ann Crawford. born circa 1805 in Scorton. Ann’s father had become a farmer in nearby Cockerton by then. By 1841 Edward had become a farmer of 100 acres with 4 labourers at Chantry House Farm, Middleton Tyas, moving on again by 1861 to farm 150 acres at Tibbersley House, Billingham. He died in 1868 from ‘accidental shock to the nervous system’ after being run over by a thrashing machine. The accident was reported in the local Darlington newspaper.Edward & Ann had 9 children: Margaret born circa 1828, John c1830, Edward c1833, William c1836, Jane c1838, Thomas c1841, George c1843, Anne c1845 and Crawford c1846. I do have further information on some of these and they were all born in either Middleton Tyas or Cockerton (near Darlington). John Lofthouse. was a groom and seemed to travel quite a lot including a brief sojourn in Hertfordshire. However he stopped in one place long enough to marry Anne Taylor. born in Ripon circa 1834, between October and December 1857 in Ripon Cathedral. They had two sons, William Edward born at Neasham circa 1858 and John George born at North Lees near Ripon between July and September 1863. Eventually the family moved to Leicestershire when John became stud groom at the stables of John Henry Stokes. a widely renowned horse dealer and benefactor. He seems to have worked there until he died in 1883. 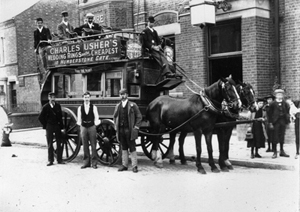 William Edward and John George both worked in Leicester as omnibus drivers and grooms for Leicester Tramways. They are shown in one of the 2 photographs. The 2nd picture shows William Edward as driver on one of the vehicles. They were both married in Leicester and one of William’s sons, Edward Crawford. was my great grandfather. For a while, he and his first wife, Maud Ellen Cundy. (known as Nellie) of Lincolnshire, worked at Leicester’s Palace Theatre [of varieties] as stage manager and wardrobe mistress respectively. 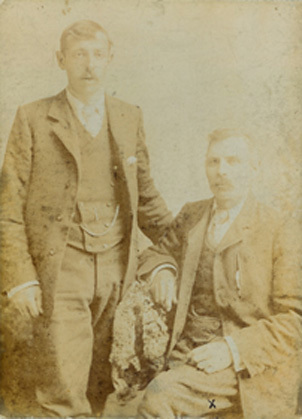 John Lofthouse on left and William Edward Lofthouse. William Edward Lofthouse. bus driver. Edward Lofthouse. born circa 1804 in Grewelthorpe Married Ann Crawford., born circa 1805 in Scorton, 18 March 1826, Darlington St Cuthbert’sDied 1868, Cockerton, Darlington9 children: Margaret born circa 1828, John c1830, Edward c1833, William c1836, Jane c1838, Thomas c1841, George c1843, Anne c1845 and Crawford c1846. Most born in Middleton Tyas, Yorkshire or Cockerton (Darlington) John Lofthouse. born circa 1830 in Middleton Tyas Married Anne Taylor. born circa 1834 in Ripon, bet Oct ‘ Dec 1857 in Ripon Cathedral Died 1883, Leicestershire 2 children: William Edward, born 1858, Neasham, Durham, John George, born Jul ‘ Sep 1863, North Lees, Ripon William Edward Lofthouse. born c 1858 in Neasham Married Sarah Ellen Heath. born 1858, Birmingham, Apr ‘ Jun 1886, Leicester Died c1907 Leicester 4 children: Maud Ellen b 1887, Olive Blanche b 1889, Edward Crawford b 1892, Ethel May b 1895. If you can help Barbara Lofthouse with her research she can be contacted by email. Thanks to Kathleen Lofthouse for sending the following newspaper report. If anyone knows the fate of the child please let us know. Newspaper report of the murder of Robert Lofthouse of Dallowgill.Born 1805. Died 1834. York always had its own hangman in the 18th century, appointed from the inmate population. Between 1802 and 1835, John (or William) Curry officiated there. He was known as “Mutton Curry” and had twice been convicted of sheep stealing, having had his death sentence commuted on each occasion. On the second occasion, he was awaiting transportation when the post of hangman became vacant and he accepted it, carrying out the hanging of three men on the 28th of August 1802 for stealing sheep, cattle and from a dwelling house, respectively. In all, Curry was responsible for at least 63 verifiable executions during his 33 year reign, which ended with a triple execution on Monday, the 6th of April 1835, when Ursula Lofthouse, Joseph Healy and William Allott were hanged for murder. From the records of the trial at York.Thomas Thorpe. ‘ I am constable at Kirby Malzeard, and know the deceased’s house. I conveyed the prisoner to York in a gig. When we got about eighteen miles from Kirby, the prisoner began to talk about her husband. She said he had a disagreeable breath , that he would hardly allow her common necessaries to live , that she believed be had saved between ‘iO and £50 , that he never told her what he did with his money , that she believed he carried it to Henry Lofthouse, and that he loved Ellen Lofthouse. better than her, which made her very unhappy. The prisoner, when called on for her defence said, “ I have nothing to say, sir , but I’m innocent.” The learned judge summed up the evidence. The jury retired, and after an absence of twenty minutesreturned into court, and pronounced the prisoner guilty. The judge, in a most affecting address, then sentenced the prisoner to be executed on Monday next. On hearing the sentence she wept profusely, and when removed from the bar was quite insensible. To a clergyman who visited Ursula Lofthouse, on Friday night, she acknowledged the justice of her sentence. An inquest held on Monday before William Dinsdale Esq. and a respectable jury on the remains of Margaret, the wife of Robert Lofthouse. farmer of Dallowgill, who had put a period to her existence by taking a quantity of arsenic on the previous Saturday. It appeared from the evidence of her husband, that a few years since they sold their farming stock & furniture & emigrated to America, in hopes of bettering their condition in life. But the speculation was a fruitless one, and they returned to their native village sometime ago, and took another farm. They had 3 children. and lived happily together while in America, but since their return she fancied that he had an improper connection with another female. they had a quarrel in consequence of this on the day in question, and he left the house, and in his absence the unfortunate woman swallowed a quantity of poison, which they had in the house for the purpose of destroying rats and she died soon after.